Waterbury Clock Co. porcelain clock, "Parlor No. 91", ca 1903. 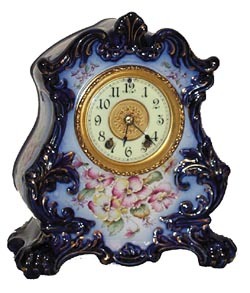 Another great Cobalt Blue clock, almost identical to the previous three, in that thedark blue and gold striping are around the outside and the pink, yellow, white, flowers are in the center. American sash and ivory colored dial with fancygilt center. All beautifully cleaned. The case is 11 inches high, 10 wide.8 day, half hour strike on a gong. Complete and original. These four CobaltBlue clocks are all very similar. Ly-Waterbury and Ly-Clocks Volume 1.